1. Launch the program by doublecliking on PhraseContext.exe. 3. Copy and paste the relevant details from the e-mail you got into the fields as shown. E-mail and Oraganization are optional. Then Click Register – . 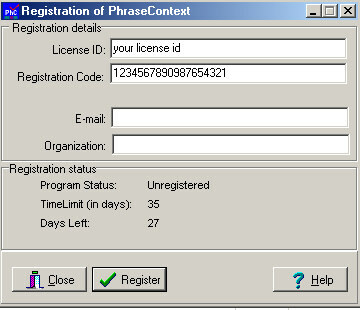 If the keys correct keys have been entered you’ll get a messages telling you that the registration was successful, and the two fields “License ID” and “Registration code” should greyed out. The next time you start PhraseContext there’s no splash screen, and the timelimit is gone. If you experience problems with payment see Share*it’s customer service.